Manipulating Strings String Functions. 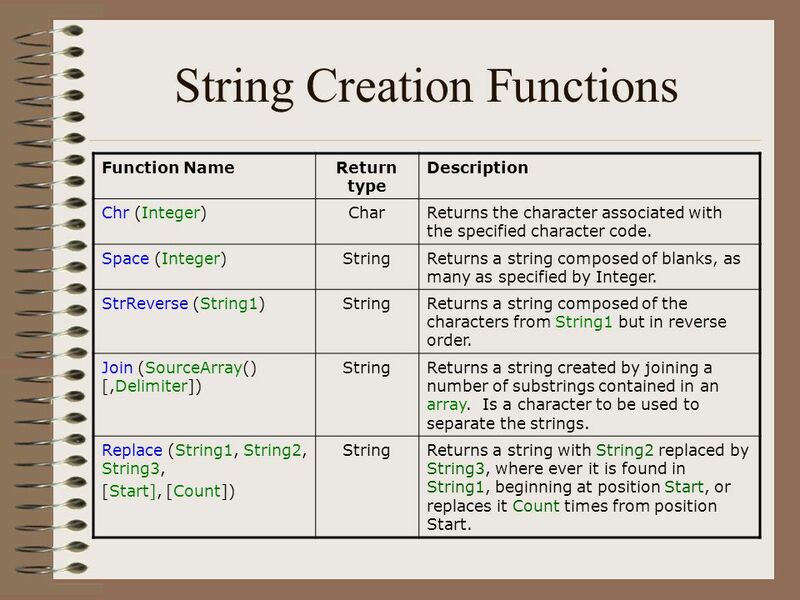 VB provides a large number of functions that facilitate working with strings. These are found in Microsoft.VisualBasic.Strings. 2 VB provides a large number of functions that facilitate working with strings. These are found in Microsoft.VisualBasic.Strings For convenience they can be grouped according to the kind of task they’re designed to carry out. 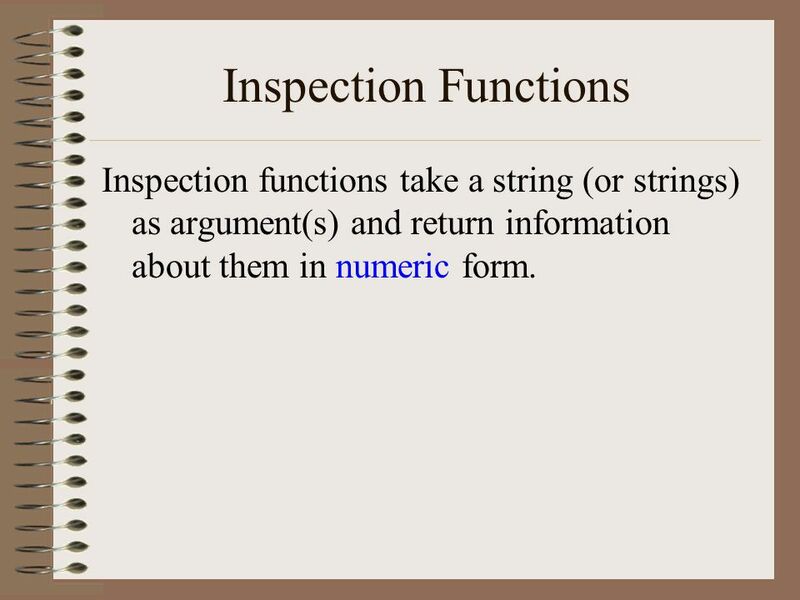 3 Inspection Functions Inspection functions take a string (or strings) as argument(s) and return information about them in numeric form. 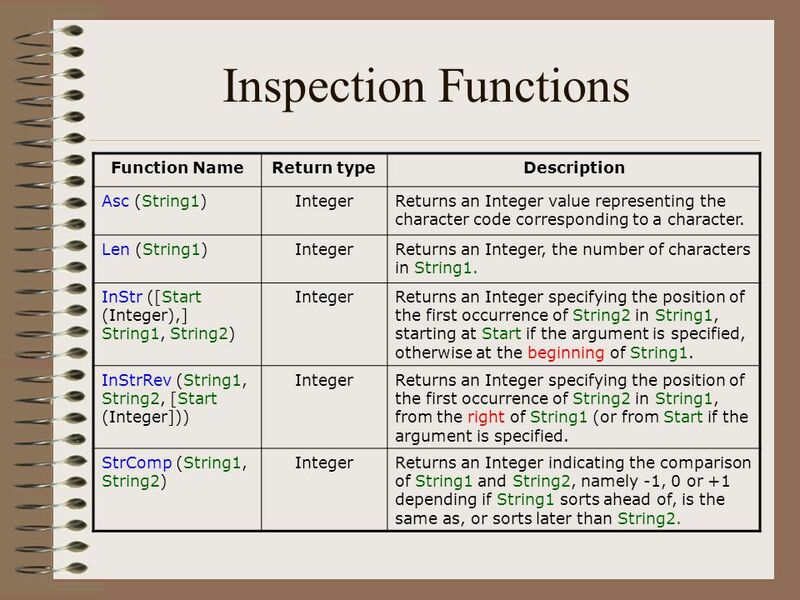 4 Inspection Functions Function NameReturn typeDescription Asc (String1)IntegerReturns an Integer value representing the character code corresponding to a character. Len (String1)IntegerReturns an Integer, the number of characters in String1. InStr ([Start (Integer),] String1, String2) IntegerReturns an Integer specifying the position of the first occurrence of String2 in String1, starting at Start if the argument is specified, otherwise at the beginning of String1. InStrRev (String1, String2, [Start (Integer])) IntegerReturns an Integer specifying the position of the first occurrence of String2 in String1, from the right of String1 (or from Start if the argument is specified. StrComp (String1, String2) IntegerReturns an Integer indicating the comparison of String1 and String2, namely -1, 0 or +1 depending if String1 sorts ahead of, is the same as, or sorts later than String2. 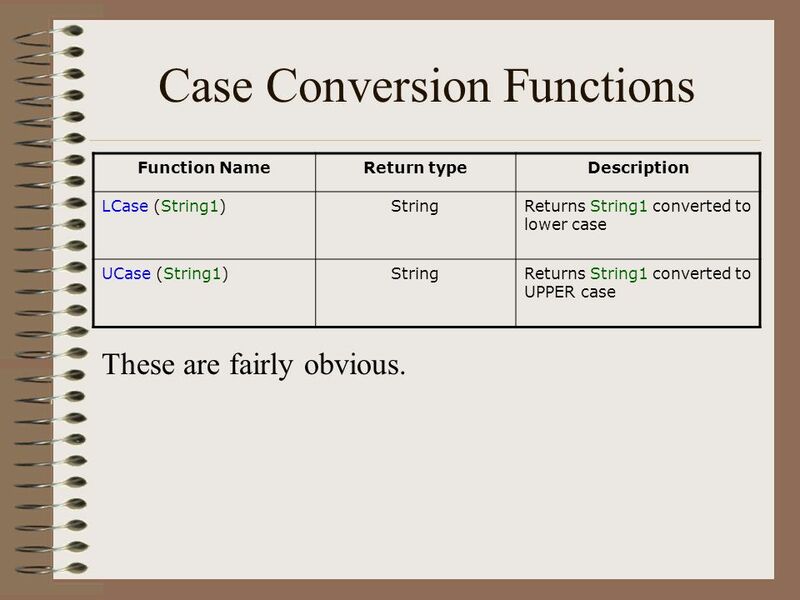 13 Case Conversion Functions Function NameReturn typeDescription LCase (String1)StringReturns String1 converted to lower case UCase (String1)StringReturns String1 converted to UPPER case These are fairly obvious. 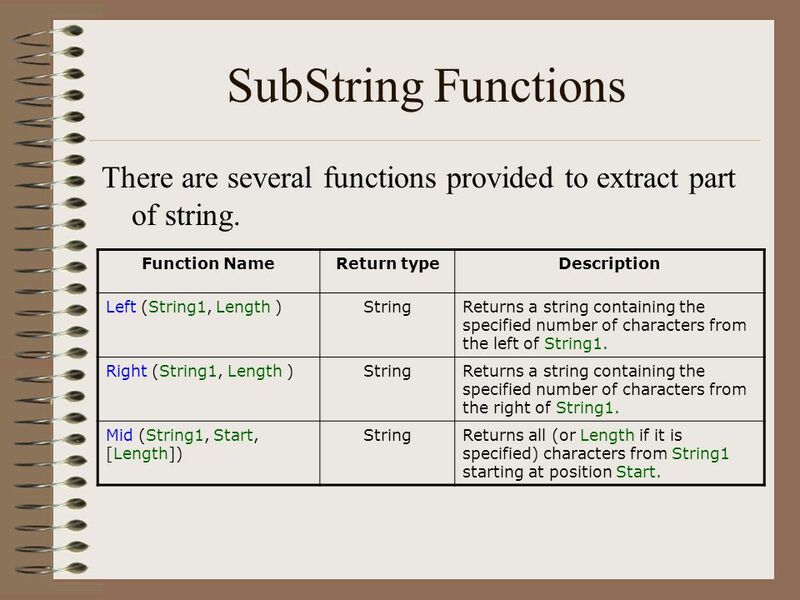 14 SubString Functions There are several functions provided to extract part of string. 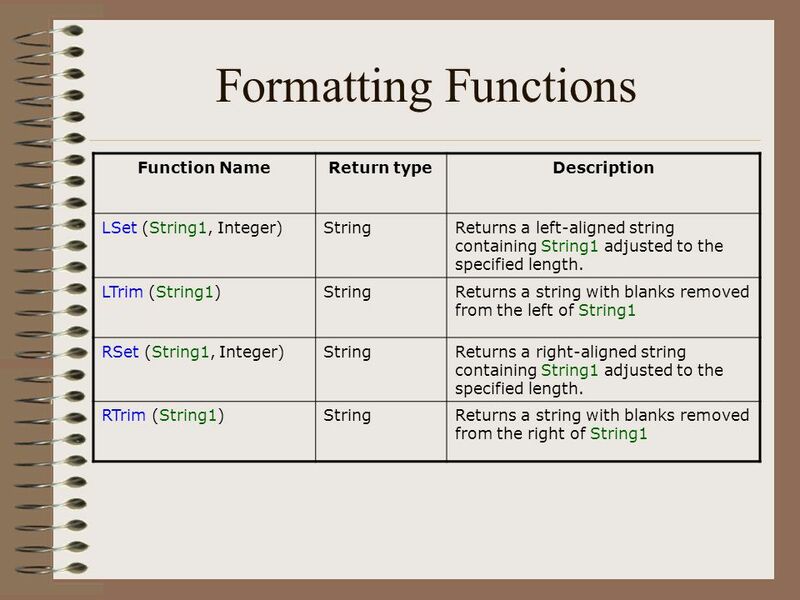 Function NameReturn typeDescription Left (String1, Length )StringReturns a string containing the specified number of characters from the left of String1. Right (String1, Length )StringReturns a string containing the specified number of characters from the right of String1. Mid (String1, Start, [Length]) StringReturns all (or Length if it is specified) characters from String1 starting at position Start. 16 String Creation Functions Function NameReturn type Description Chr (Integer)CharReturns the character associated with the specified character code. Space (Integer)StringReturns a string composed of blanks, as many as specified by Integer. StrReverse (String1)StringReturns a string composed of the characters from String1 but in reverse order. Join (SourceArray() [,Delimiter]) StringReturns a string created by joining a number of substrings contained in an array. Is a character to be used to separate the strings. Replace (String1, String2, String3, [Start], [Count]) StringReturns a string with String2 replaced by String3, where ever it is found in String1, beginning at position Start, or replaces it Count times from position Start. 22 String Creation Functions Replace (“some people”, “o”, “a”) “same peaple” Replace (“some people”, “o”, “a”,, 1) “same people” Replace (“some people”, “o”, “a”, 5) “ peaple” Notice that Start indicates the starting character for the Result string. 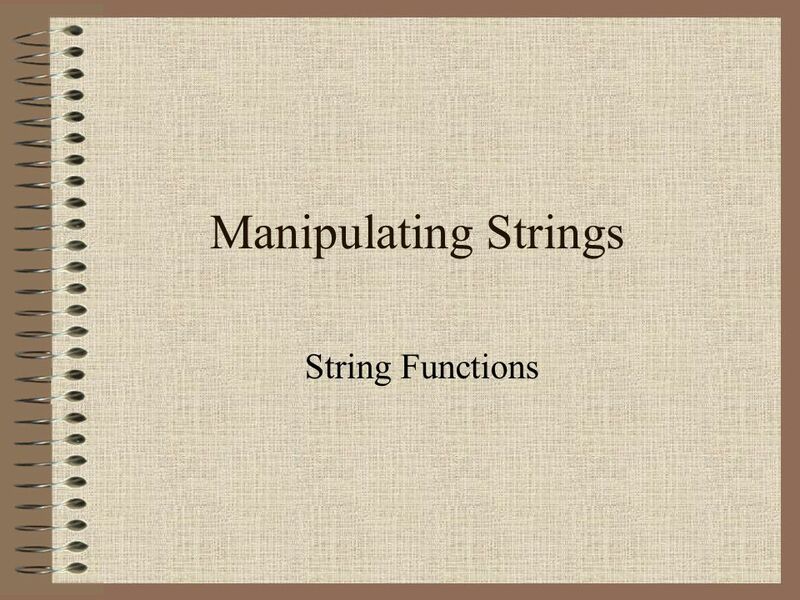 Download ppt "Manipulating Strings String Functions. 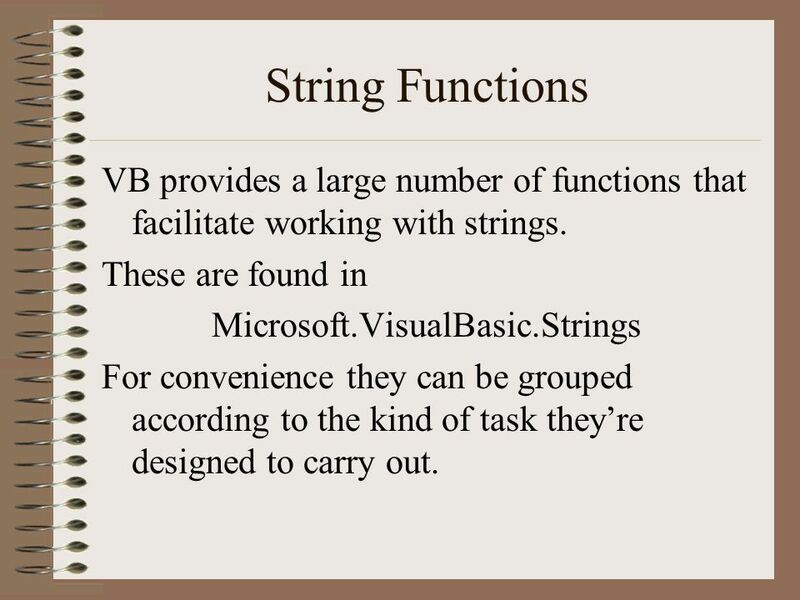 VB provides a large number of functions that facilitate working with strings. These are found in Microsoft.VisualBasic.Strings." 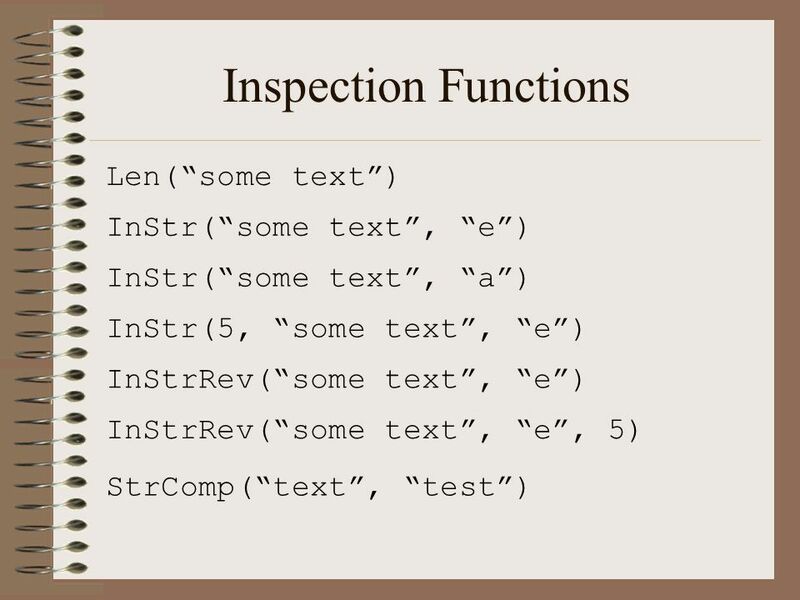 Computer Science & Engineering 2111 Text Functions 1CSE 2111 Lecture-Text Functions. 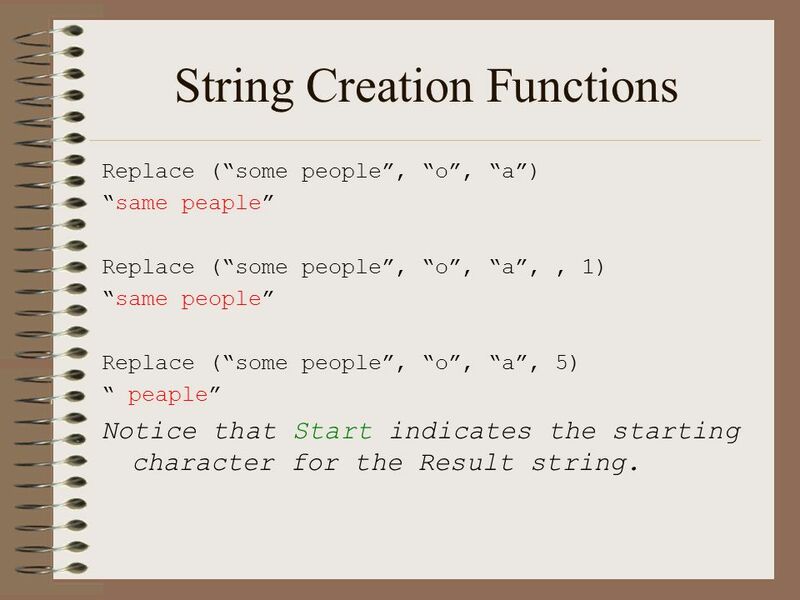 Character and String definitions, algorithms, library functions Characters and Strings. Proyek Queri-queri Lanjut dan Sub-subqueri. Variables dan Data. Slide 1 VB Programming Fundamentals. Slide 2 Visual Basic Language v VB language is powerful and easy to use v Descendent of BASIC (Beginner's All-Purpose. Strings in Visual Basic Words, Phrases, and Spaces. On to… string operations & functions. 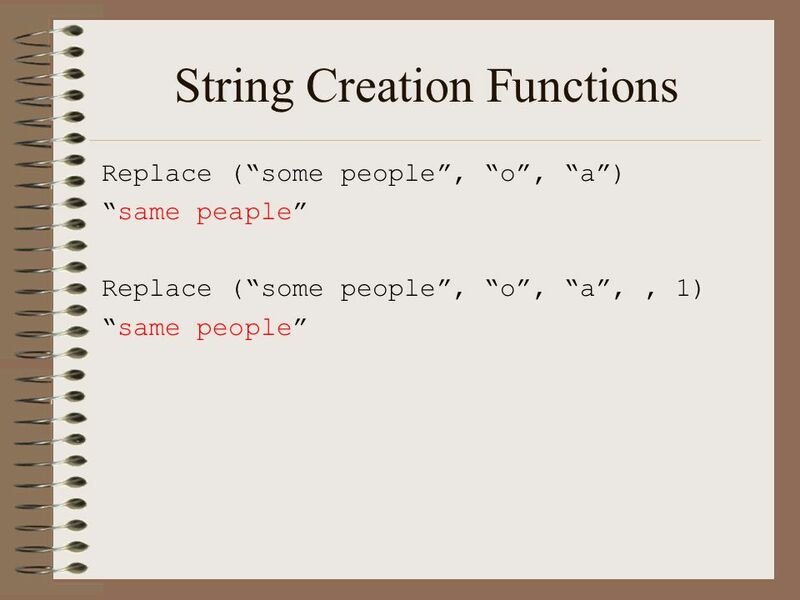 Concatenation (&) §When we want to combine two character strings into one new (longer) string, we can concatenate. BACS 287 Visual Basic String Manipulation. BACS 287 Visual Basic Strings In Visual Basic, a “string” is a series of text, numbers, and special characters. Chapter 06: Lecture Notes (CSIT 104) 1 Copyright © 2008 Pearson Prentice Hall. All rights reserved. 1 1 Copyright © 2008 Prentice-Hall. All rights reserved. Chapter 9 Creating Formulas that Manipulate Text Microsoft Office Excel 2003. Copyright © 2012 Pearson Education, Inc. Publishing as Pearson Addison-Wesley C H A P T E R 9 More About Strings. Handling Lists F. Duveau 16/12/11 Chapter 9.2. Objectives of the session: Tools: Everything will be done with the Python interpreter in the Terminal Learning. Chapter 10 Selected Single-Row Functions Oracle 10g: SQL.